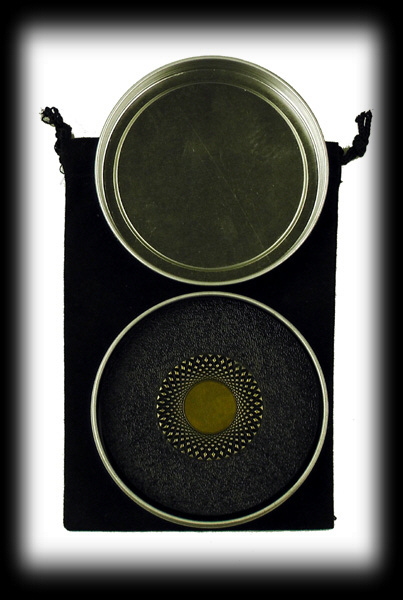 This new professional Double Silver Disk Monte set / with extra silver dollar disk can be displayed as a con game or go beyond the standard con game display. 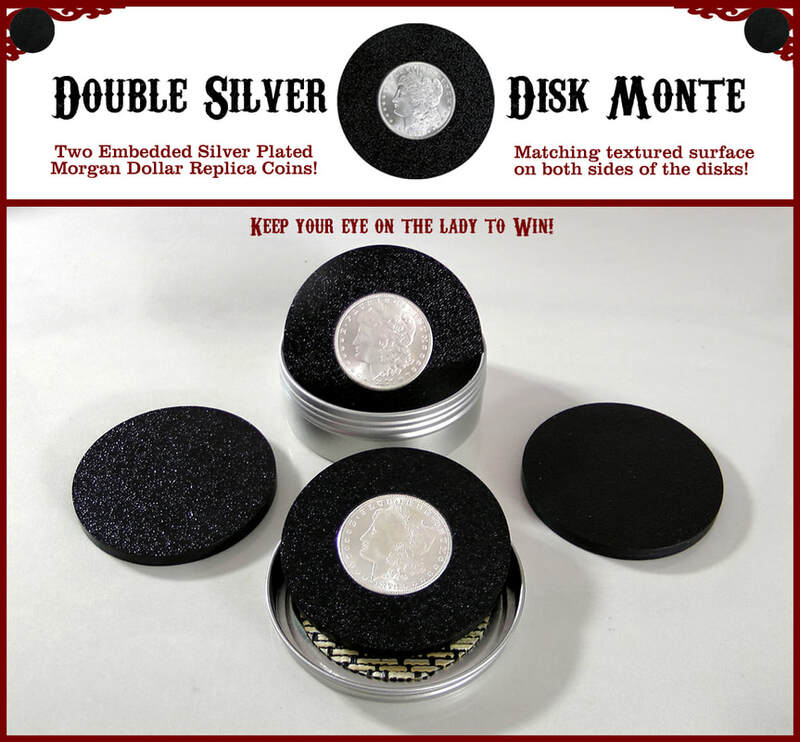 By having the extra winning silver dollar disk and the matching texture surface on all sides of the disks, you are able to do wonders that other disks or even cards can't do with the Monte game. ​The game is still played with three disks, but a regular disk can be switched out for an extra silver dollar disk to bring some amazing displays. With the use of doing a false disk turnover on one of the winning disks when using two winning disks and one blank disk, you can always control the outcome. The extra silver dollar disk is never known to be in play at any time. 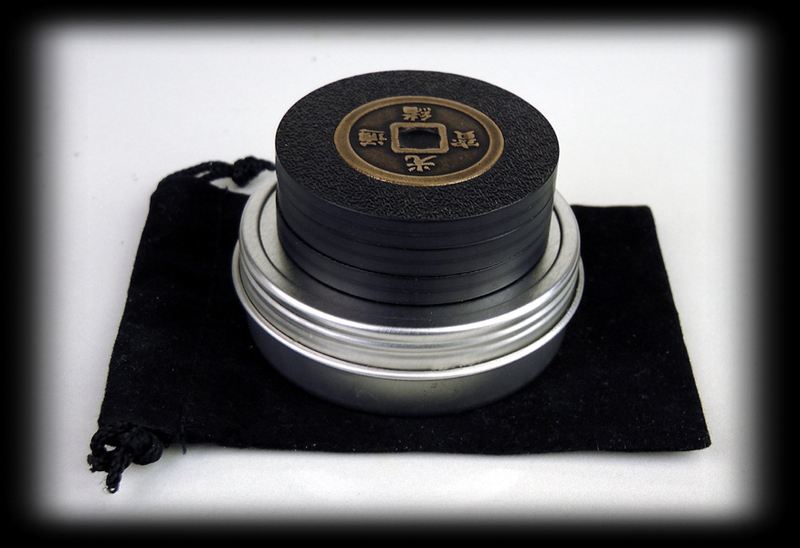 Most of the time the extra silver dollar disk is not needed. Only when you want to do some impossible entertaining surprises. Where the spectator will walk away wondering how it was all done. In part due to silver hoarding in the Civil War, the United States Mint first used cupronickel for circulating coinage in three-cent pieces starting in 1865, and then for five-cent pieces starting in 1866. Prior to these dates, both denominations had been made only in silver in the United States. 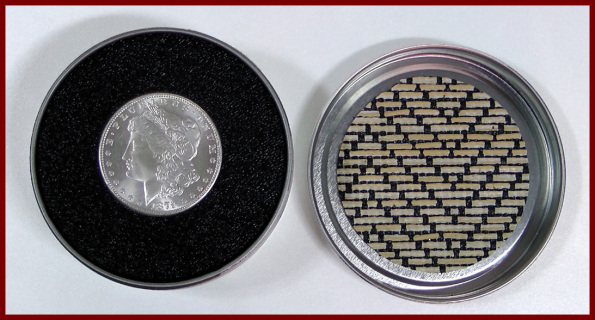 Cupronickel is the cladding on either side of United States half-dollars (50¢) since 1971, and all quarters(25¢) and dimes (10¢) made after 1964. Currently, some circulating coins, such as the United States Jefferson nickel (5¢). 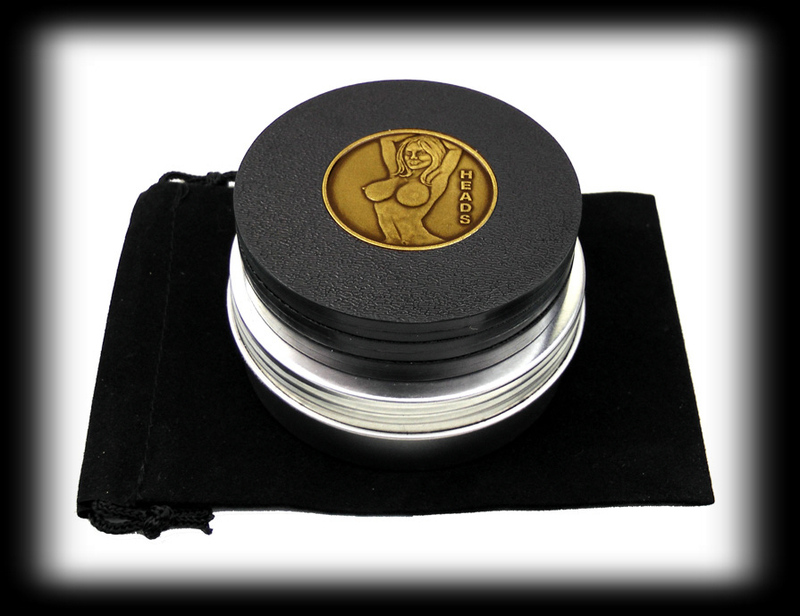 The coin made of cupronickel and silver plated mades it an excellent replica coin. 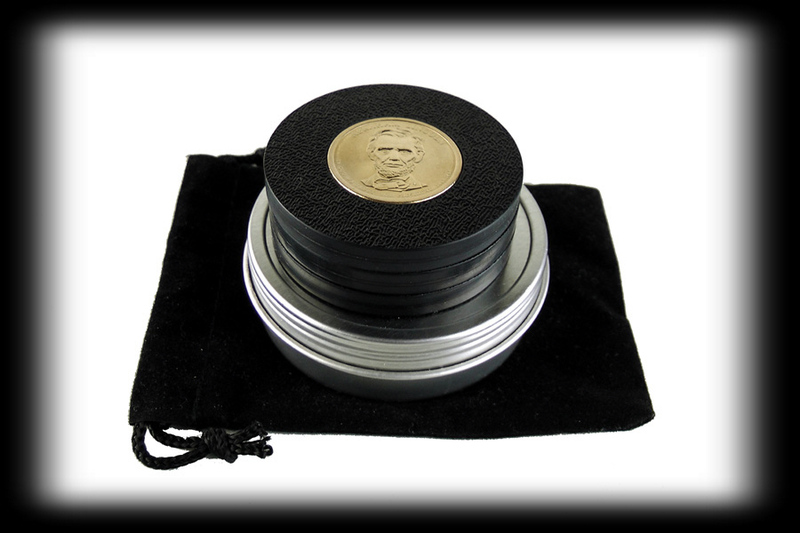 ​The Morgan Dollar Replica Coins disks are a three layer disk. 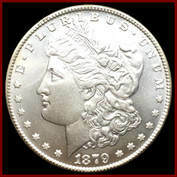 The embedded Cupronickel - Silver Plated Morgan Dollar Replica Coins are some of the best replica coins I have seen, you can't tell the difference from the real coins. This coin stands out very well. The embedded coin adds more weight (26.76 grams) to the disk where it helps to know the location of the money disk by having more weight than the blank disks. All the disks are 3" diameter and 1/4" thick. We feel this is a good size for easy handling. 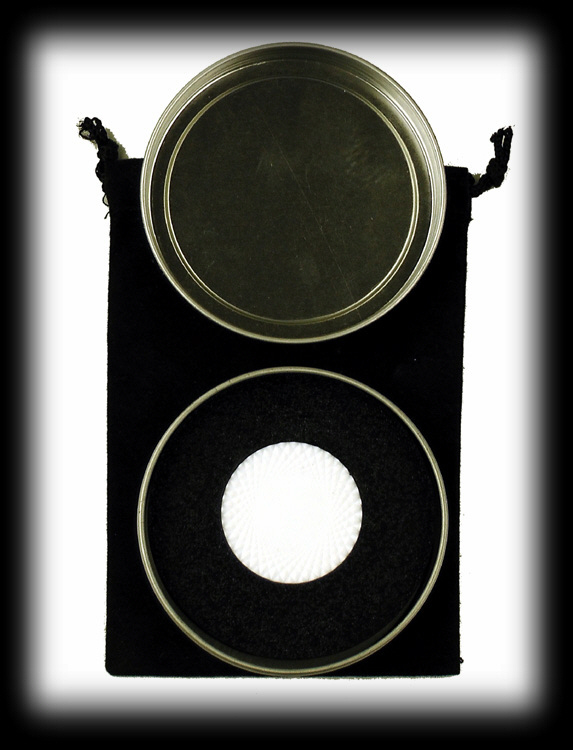 The blank disks are two tough ABS black textured layers that are bonded together and precision machined to all match the same diameter. This type disk set takes much more time to make than other disk sets at a very fair price and brings far more features. 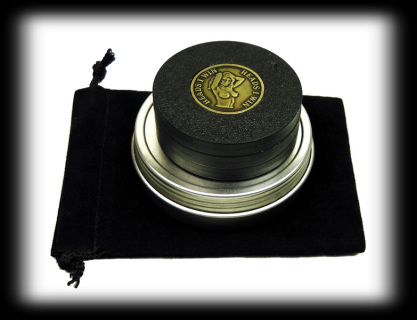 These disks are made for the professional magician with high quality standards. 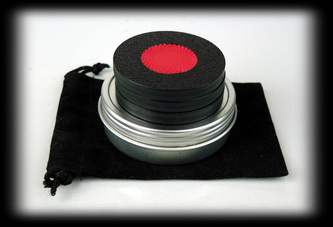 The set also comes with a metal screw top cushion can to carry all four disks. with embedded replica morgan dollar coin. 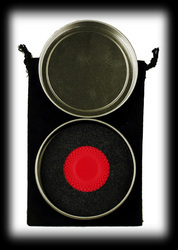 ​This new professional 3 Disk Monte Pro set can be displayed as a con game or go beyond the standard con game display. By having the extra winning white dot disk and the matching texture surface on all sides of the disks, you are able to do wonders. The game is still played with three disks, but a regular disk can be switched out for an extra white dot disk to bring some amazing displays with the use of the false disk turnover. The extra white dot disk is never known to be in play at any time. 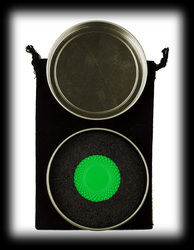 Most the time the extra dot disk is not needed. Only when you want to do an impossible entertaining surprise finish. Where the spectator will walk away wondering how it was all done. New Embedded White Ceramic Disk: The white dot disk is a three layer disk. The embedded white dot is a 1-1/2" ceramic disk. This stands out very well and can be cleaned. 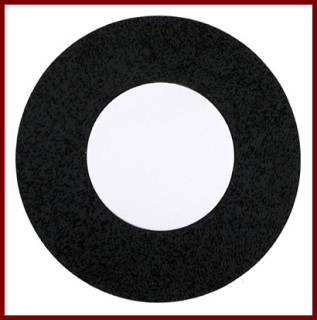 This new embedded ceramic white dot disk brings more weight to the disk where it helps to know the location of the white dot disk by having more weight than the blank disks. All the disks are 3" diameter and 1/4" thick. We feel this is a good size for easy handling. 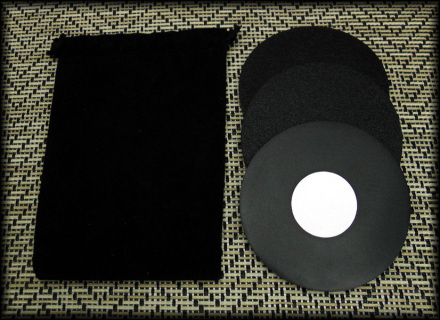 The blank disks are two tough ABS black textured layers that are bonded together and precision machined to all match the same diameter. This type disk set takes much more time to make than other disk sets at a very fair price and brings far more features. 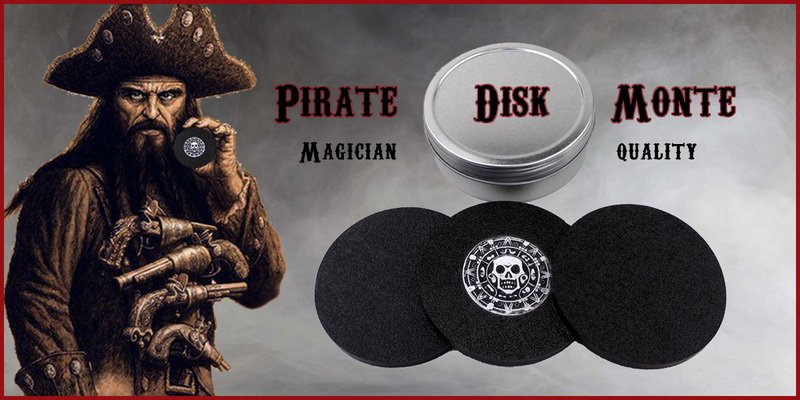 These disks are made for the professional magician. ​The disk carry can holds all four disks. 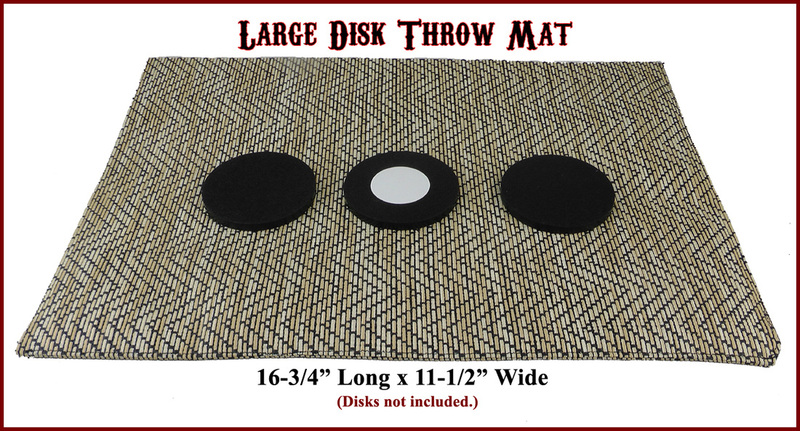 The inside of the can bottom and cap have a fabric cushion of the same matching material as our disk throw mats. This cushions the disks to fit well without rattling around inside. We are now offering a way to add to your disk sets. Just purchase the insert disk, to work with the two blank disks you already have. The best way to order an extra insert disks is when you are ordering your full disk set to get a good matching set. 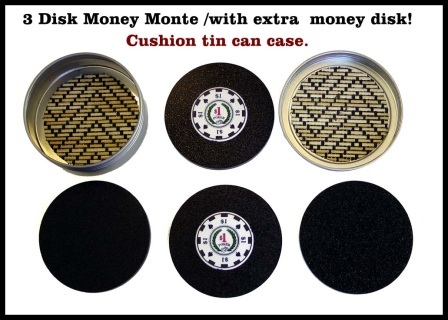 ​This new professional 3 Disk Money Monte set / with extra money disk can be displayed as a con game or go beyond the standard con game display. 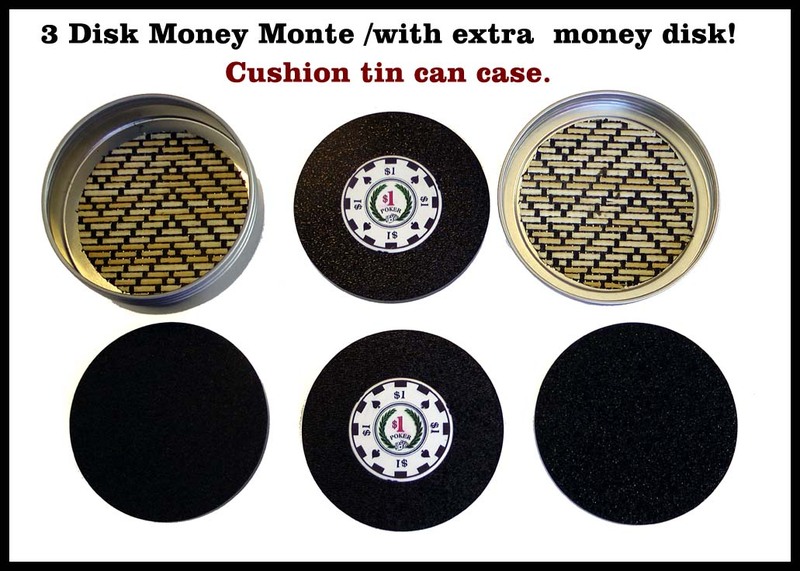 By having the extra winning white money disk and the matching texture surface on all sides of the disks, you are able to do wonders. ​The game is still played with three disks, but a regular disk can be switched out for an extra white money disk to bring some amazing displays with the use of the false disk turnover. The extra white money disk is never known to be in play at any time. Most the time the extra money disk is not needed. Only when you want to do an impossible entertaining surprise finish. Where the spectator will walk away wondering how it was all done. New Embedded White Ceramic Money Disk: The white money disk is a three layer disk. 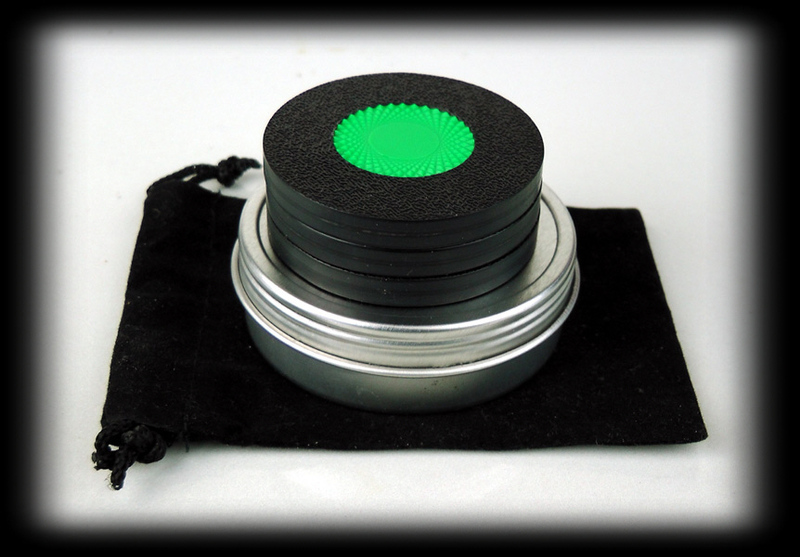 The embedded white ceramic $1 poker chip is a 1-1/2" . This stands out very well and can be cleaned. 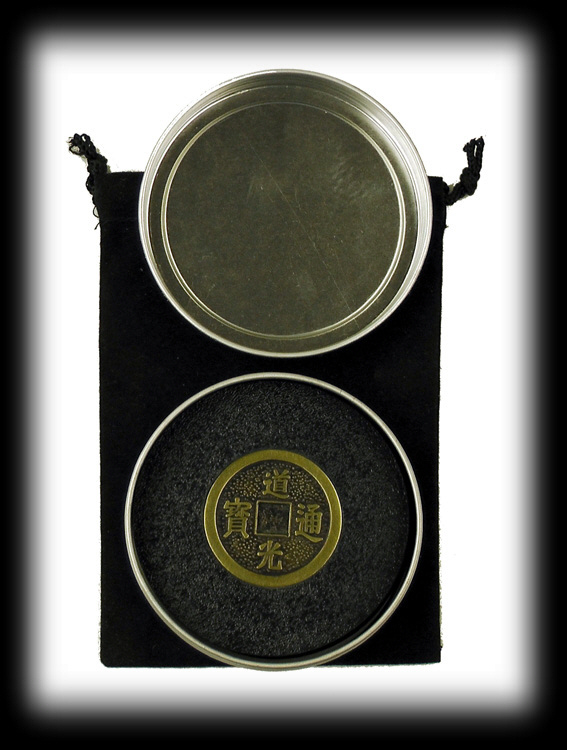 This new embedded ceramic white money disk brings more weight to the disk where it helps to know the location of the white money disk by having more weight than the blank disks. All the disks are 3" diameter and 1/4" thick. We feel this is a good size for easy handling. * Fully adjustable surface on how you throw or what sound you want. ​This size mat makes it where you can even perform all of your other type tricks on. Small - Disk Throw Mat ~ 13" x 7"
The slide resistant fabric with the newspaper inside gives the perfect throwing surface. * The disks standout with a better natural dimensional surface than the newspaper by it's self. The Pirate Disk Monte set can play well for any magician working the renaissance fairs or anywhere with the old pirate theme. One disk with 1 - 1/2" diameter - White Pirate Disk insert. The Joker Disk set are 3-1/4" Diameter x 1/4" thick. 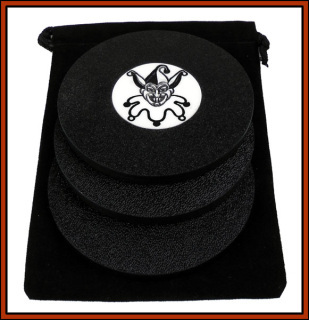 The embedded insert is carved out as a playing card joker and molded of white high impact plastic. Black dye is applied to bring out the detail of the joker. All disks are Scratch Resistant on both sides. This brings the feature of being able to do false turn overs when needed. * Note: All the 3 Disk Monte Sets come without handling instructions at this time. These sets are for the ones that already know the standard handling of the 3 Disk Monte., which is done like the 3 card Monte with adjustments for the extra thickness. 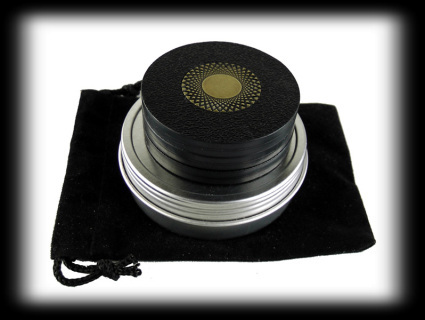 ﻿﻿* Note: Other size disk sets are available on request like; 3-1/4" & 3-1/2 " diameter disk sets, with the Scratch Resistant surface on both sides of the disk. The standard disk sets we made are 2" & 3" diameter to be able to do a false disk turnover easier. The disk size that are used on the street are normally 3-1/4 with a smooth surface on one side and a textured surfaced on the other side. The false turnover can not be done with these type disk, so size does not matter. The false turnover can only be done with disks that have the same type surface on both sides of the disk that we make standard. Specify in checkout notes as to what color insert you want. You can not find a better match set! When ordering a full disk set or if you already have a full disk set. 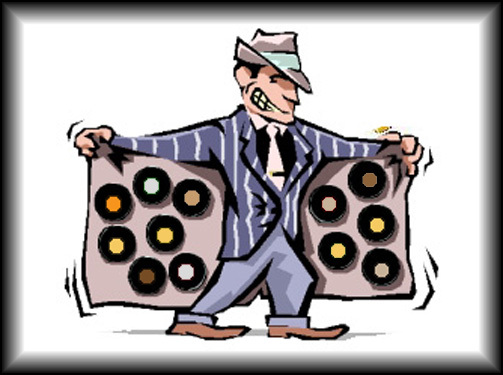 The best way to order the extra insert disk is when you are ordering your full disk set. 1 - 3" Disk with embedded plastic insert of your choice - "Note which one in checkout." The best way to order the extra insert disk is when are you ordering your full disk set. 1 - 3" Disk with embedded metal insert of your choice - "Note which one in checkout." See Top page slideshow to view full set images! The Street 3 Disk Monte Sets are only scratch resistant on one side of the disks. 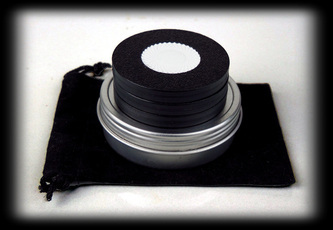 Standard size is 3-1/4" diameter and are 1/4" thick. Has a 1-1/4" white vinyl sticker on the money disk. These meet the street 3 disk Monte Specifications. 1 - Disk Carry Bag. 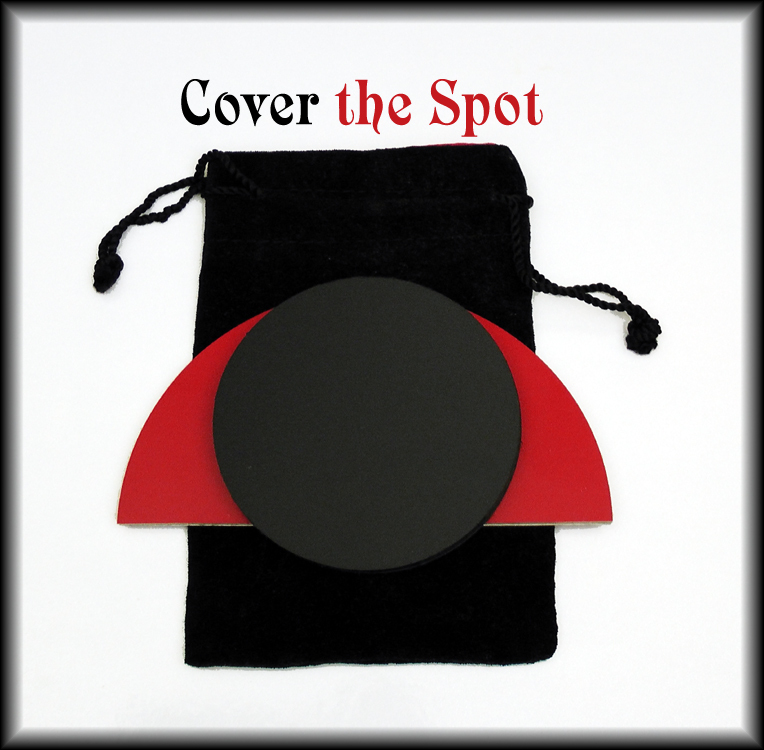 Magical swindle game that fit in a compact package to carry anywhere. 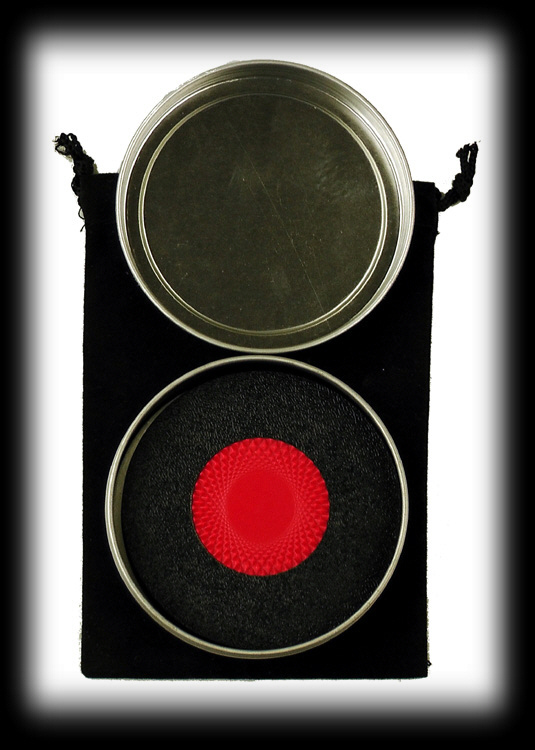 1 - Large red - white 2 ply hard plastic folding disc. 5 - Plastic disc - black on both sides. 1 each - 5-1/4" Diameter x 1/16" Thick - two ply red and white. Folds in half to carry easier.